And as we can see, the Chinese government is rubbing itself all over the capital of Tibet. 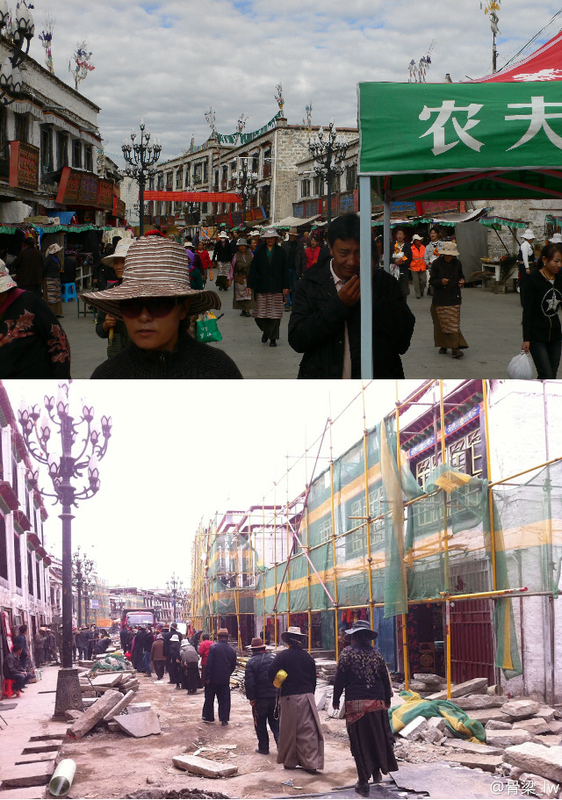 The photos below show the Barkhor circuit, which winds around Old Lhasa, and passes the Jokhang Temple – the most sacred in Tibet. The picture on the top is one that I took in 2009; the one underneath was taken in 2013 by a Tibetan blogger called Woeser. (Woeser writes in Mandarin, but her post on the destruction of Old Lhasa has been translated into English for the High Peaks Pure Earth blog. Their post contains more photos of what is happening in Lhasa.) Although the pictures are not taken from identical spots, they do show the same area of the Barkhor – and the differences are stark, and devastating. This is colonisation as ‘renovation’, and it is being ignored. So we are left with another tragedy wrought by the acidic effects of ideology on heritage and culture. The fact is that in Lhasa’s case, the damage is done; no letters, protests or sanctions will bring the old city back to what it was. As with so many ancient sites that broadcast spiritual mystique around the world, and in turn have the wonderment of millions projected back onto them, Lhasa has an inherent mythology which obstructs the myth-making necessary for nation-building. Combine this with the commercial colonialism that blights so much of the world, and you end up with one of the most revered, adored and prolifically inspiring places in history having an enormous state-sponsored shopping centre built in the middle of it. There is, of course, not just cultural devastation afoot. The government’s project in Lhasa is not an isolated one; it is part of a wider drive to photoshop the entirety of Tibet (or the Tibetan Autonomous Region, to give it its official name – another spore from China’s fecund doublespeak dictionary) into something more befitting a ‘socialist republic’. Currently, it is estimated that over two million Tibetans have been ‘rehoused’ – a benign term for an activity that is slowly strangling an indigenous people’s livelihoods and way of life. As with Lhasa, the silence from the rest of the world has been deafening; God forbid we should threaten ties with the second-largest economy in the world. I am reminded of a quotation from an American diplomat, justifying the pre-9/11 US government rolling over when lobbied by oil firms to go easy on the Taliban, so that a pipeline could be built through Afghanistan: “There will be Aramco [a Saudi oil company], pipelines, an emir, no parliament and lots of Sharia law. We can live with that.‟ Money talks, but it also shuts people (and governments) up. So goodbye, Lhasa. Another poignant dream has been turned into a painful memory. But at least the Chinese government can’t touch that.